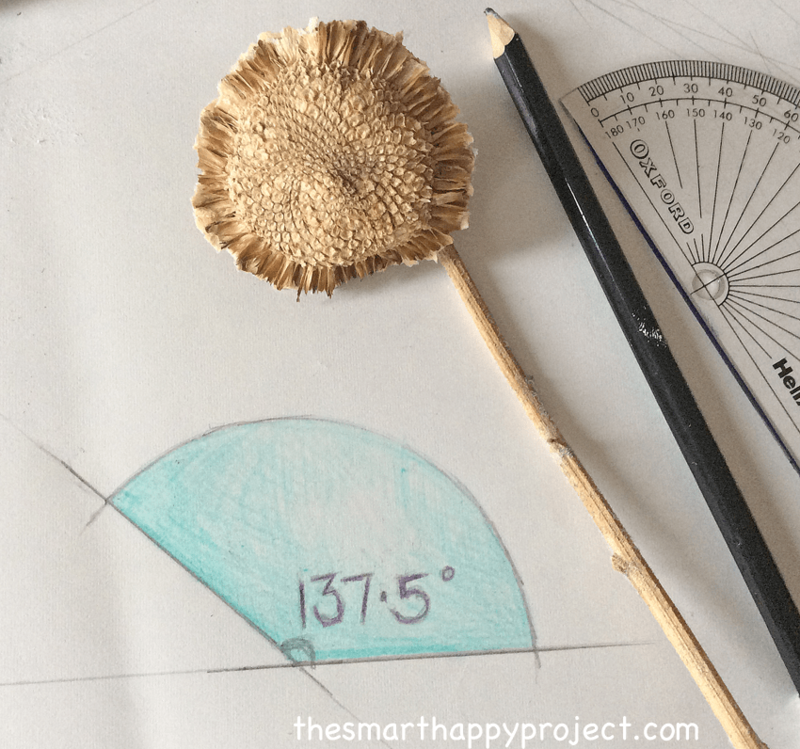 It would be easy to get way too technical when talking about Fibonacci in a Sunflower. That is not my intention. The main objective of this post is to highlight what can be observed in a sunflower seed head and an encouragement to marvel at the patterns. This is a stunning sunflower courtesy of Flickr, (ones I grow never seem to be so perfect). 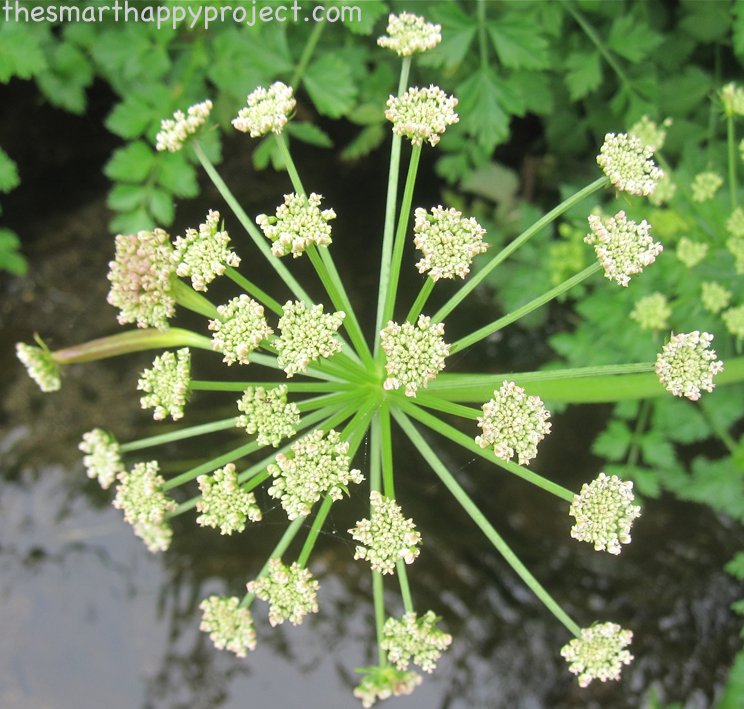 Try to pick out the spirals that are formed by the positions of the seeds. 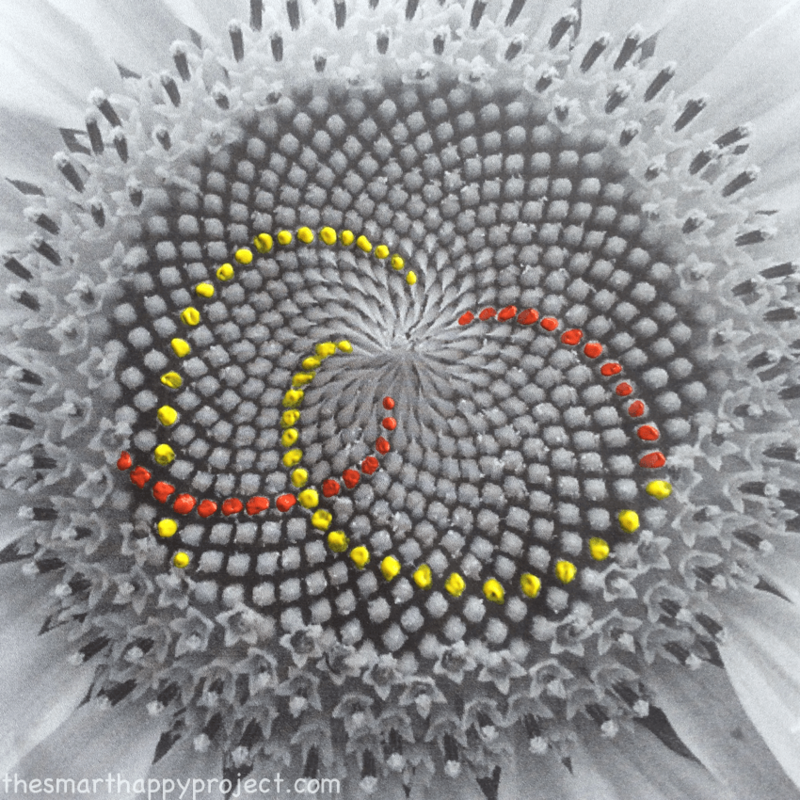 The second black and white image has examples of the spirals highlighted so you know what to look for in sunflowers you find. How do sunflower seeds form? The word “Phyllotaxis” originating from the Greek words for ‘leaf’ and ‘arrangement’ is the name given to the pattern in sunflower seeds. This is also visible in other natural forms eg: pine cones or pineapple. Spiral phyllotaxis uses an angle of 137.5 degrees to position each new seed formed. This proves to be the perfect angle by which to tightly pack in as many seeds, so creating this pattern. Like I said, it could get way too technical. 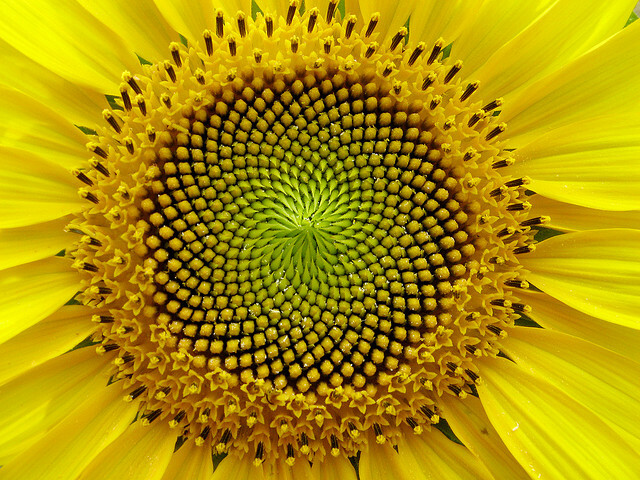 But, if you would like to understand the link between phyllotaxis, the golden ratio and fibonacci in a sunflower, this video by Eterea Studios ‘Nature by Numbers’ does a great job of explaining it visually. The plant forms a seed (or flower) then turns the angle of 137.5, forms another , then turns the angle again before forming another and so on. In this picture with the orange circles, start with the smallest circle towards the centre and follow the arrows around the spiral. Each circle is a seed/flower and the green shaded area are the turn of the angle- only first three shown. Imagine these seeds all growing larger and as the flower develops they push into the centre creating the pattern you see in the sunflower image. 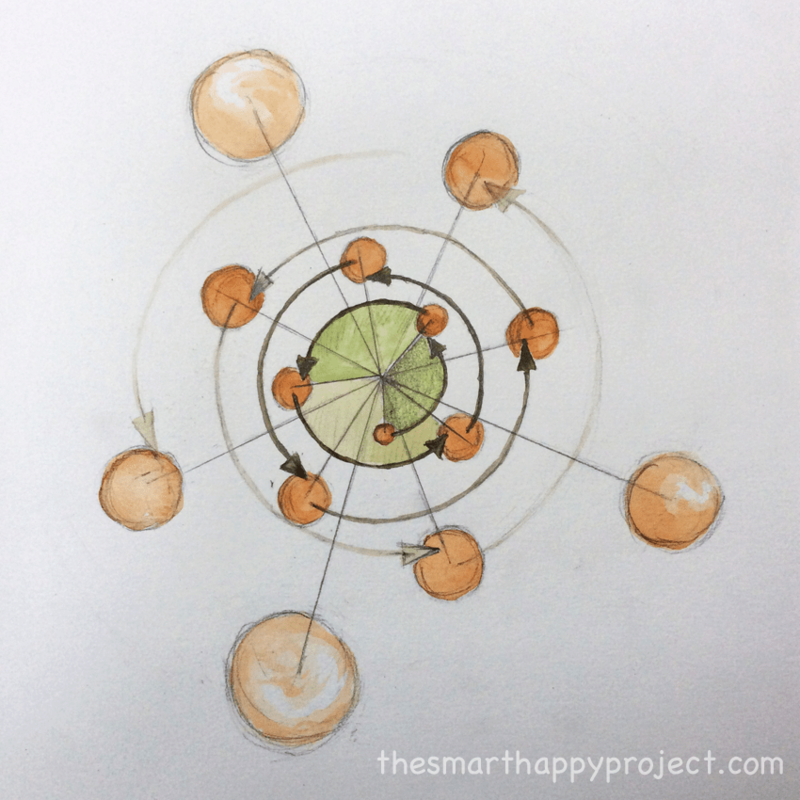 More on Fibonacci numbers in nature and in particular a cabbage which features as part of our Shape Hunting series. Want to see more Spirals in Nature? click the link an find lists of where they can be found in rocks/water/plants/animals the list is by no means finished!